A new book by former U.S. Rep. Patrick Kennedy, youngest son of the late Sen. Edward Kennedy, openly discusses what he says are the mental illnesses and addictions of himself and his family members, and takes on what he portrays as a veil of secrecy used to hide the problems of America's most famous political family. The memoir, "A Common Struggle," due out Monday, focuses heavily on his relationship with his father and how the younger Kennedy often felt he let his father down while coping with bipolar and anxiety disorders and repeated trips to rehab, even as a Rhode Island congressman. By his telling, it was a singular experience growing up a Kennedy: Family members have the habit of giving each other autographed photos of themselves; he got one from his father when he was just a baby. A family photo printed in the book depicts him in his bedroom as a young child showing off his aquarium to Henry Kissinger. But even stranger was browsing through a bookstore one day and discovering a shelf of Kennedy books, and realizing all the family secrets he wasn't supposed to talk about were written there, he writes. "The books were often riddled with inaccuracies, but also riddled with facts that probably would have been much easier to hear first from close family members and perhaps with some context," Kennedy writes. He says his father spoke with him only once about his 1969 car accident on Chappaquiddick Island that killed his father's passenger, Mary Jo Kopechne. It happened one year as the anniversary approached. "'I just want you to know how bad I feel about everything, and I'm really sorry you have to hear about it,'" he says his father told him. "That was it. Then we just walked in silence." Many of the details in the book are no surprise. Kennedy, 48, has been open in recent years about his belief that his father had PTSD after seeing both his brothers assassinated - then being forced to relive the killings whenever they were replayed on television. But the book contains interesting windows into how his father coped. Sen. Kennedy, for example, wrote a letter to his son when he decided to run for president - to be delivered if he was assassinated. He also recounts what happened after a 1979 CBS interview when his father famously choked when asked why he wanted to be president. The two went sailing, and the elder Kennedy tried to pretend everything was fine, but kept shaking his head and muttering. "I had never seen him so upset with himself," he writes. Kennedy describes worrying that his father was drinking too much, particularly around the time of the 1991 sexual assault trial of his cousin, William Kennedy Smith. He writes that he, his brother and sister staged an "anemic" intervention, which their father rejected, telling them he was trying to get help from a priest. His relationship with his father was chilly for years after that, he writes. So chilly that he decided to run for Congress in 1994 without speaking with his dad first. But their relationship righted itself after he took office in Washington the following year, he says. Ted Kennedy Jr. disputed the accuracy of the book on Sunday, saying in a written statement that he was "heartbroken" that his younger brother had chosen to write "an inaccurate and unfair portrayal of our family" that was "misleading and hurtful." "I am proud of my brother Patrick for his tremendous work to make mental health parity part of our national conversation and I admire him for his candor about his own challenges. However, I am heartbroken that Patrick has chosen to write what is an inaccurate and unfair portrayal of our family," Ted Kennedy Jr. said in a statement. "My brother's recollections of family events and particularly our parents are quite different from my own," he went on to write, although he did not give specifics. Patrick Kennedy's book describes the first time he got drunk - at age 10 at a state dinner on a diplomatic trip to China - and substance abuse that grew to include cocaine, Adderall and OxyContin. He details trip after trip to rehab starting in high school and his paranoia that someone would recognize him and go public (which did happen). The book opens on Kennedy's 2006 car crash outside the U.S. Capitol - which his father downplayed as "a little fendah bendah" in his Boston accent - that he blamed on a mixture of Ambien and Phenergan. He recounts other incidents he attributed to drinking: berating a security guard at the Los Angeles airport and having his girlfriend call the Coast Guard to retrieve her off his boat. Kennedy remained in politics until 2010, when he decided not to run for Congress again, fearing the job would kill him. He writes that he has been sober for more than four years, and now lives with his wife, Amy, in New Jersey with their children. The couple met not long after his father died in 2009. In one of the more painful stories in the book, Kennedy recounts the "seething anger and outrage" he felt after being told only Ted Jr. would be allowed to eulogize his father. 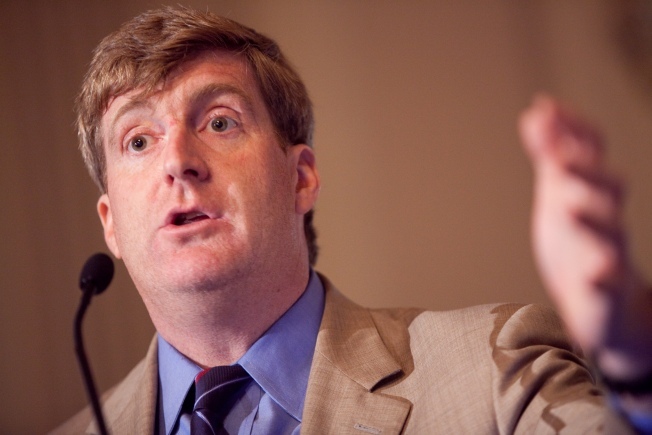 At the time, Patrick Kennedy was abusing various substances. He writes that he felt "that I had been deemed not worthy to pay tribute to him because I had an illness that could be embarrassing or inconvenient," he wrote. He then was given a letter from his father, written in the 1980s, in which he asked his son to speak at his funeral. Feeling vindicated, Kennedy, with a shaky voice, delivered the eulogy.